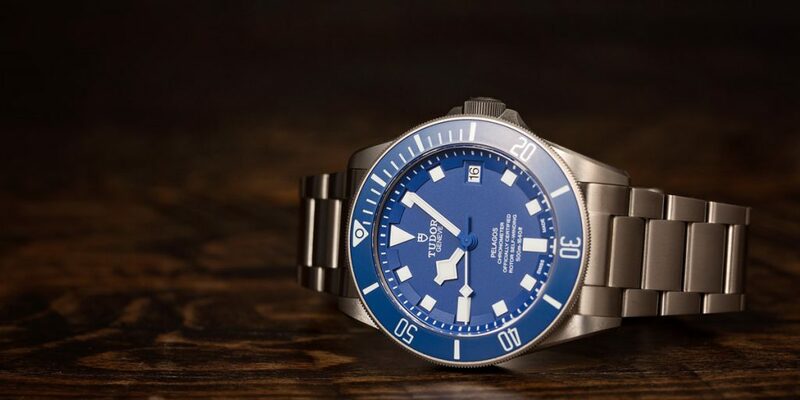 Since their re-launch into the American market in 2013 after almost a decade of absence, Tudor has been making great strides in gaining popularity among the watch enthusiast crowd. Tudor is set on shaking off the unfortunate label of being Rolex’s cheaper alternative by presenting a slew of watches that are not only well designed, but that run on in-house movements too. One thing you’ll notice about modern Tudor watches is how heavily influenced they are by vintage Tudor watches. With that in mind, let’s compare a vintage-inspired Tudor Black Bay Heritage with an actual vintage Tudor Submariner to see how much the brand has evolved. In 1969, Tudor launched the second generation of their Submariner watches with the 7016 without a date and the 7021 with a date window (the model you see here). This pair of watches introduced the now-iconic “snowflake” style hands characterized by squared edges. Prompted by the requirements of the French National Navy, the design of the hands offered a larger surface area for luminescence, therefore providing better underwater legibility for the military divers. These two watches were also the first Tudor Submariner models to include the then-new Tudor shield logo rather than the preceding rose logo. 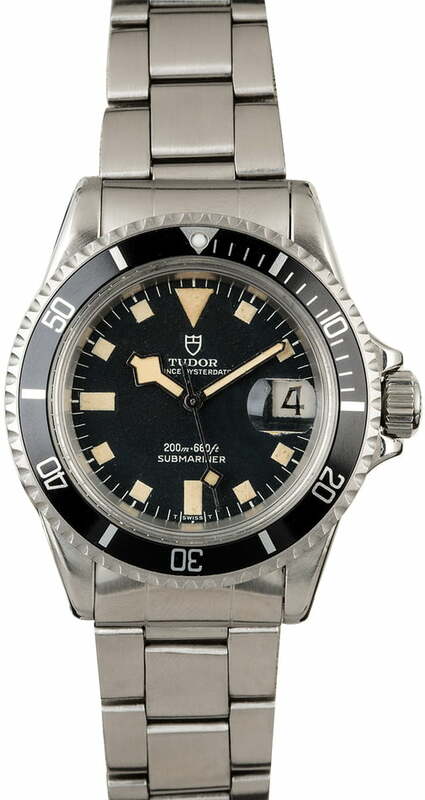 The vintage Tudor Submariner ref. 7021 sports a 39mm Oyster case with crown guards flanking the winding crown. On top of the diving watch sits a 60-minute marked bidirectional rotating black bezel, along with a thick flat Plexiglas crystal protecting the dial. Waterproof to 200 meters, the Tudor Submariner 7021 runs on an ETA 2483 automatic movement operating at a frequency of 18,000 beats per hour. Released in 2016, the Tudor Black Bay Bronze clearly takes its design cues from vintage Tudor dive watches, but it is built to suit modern expectations. 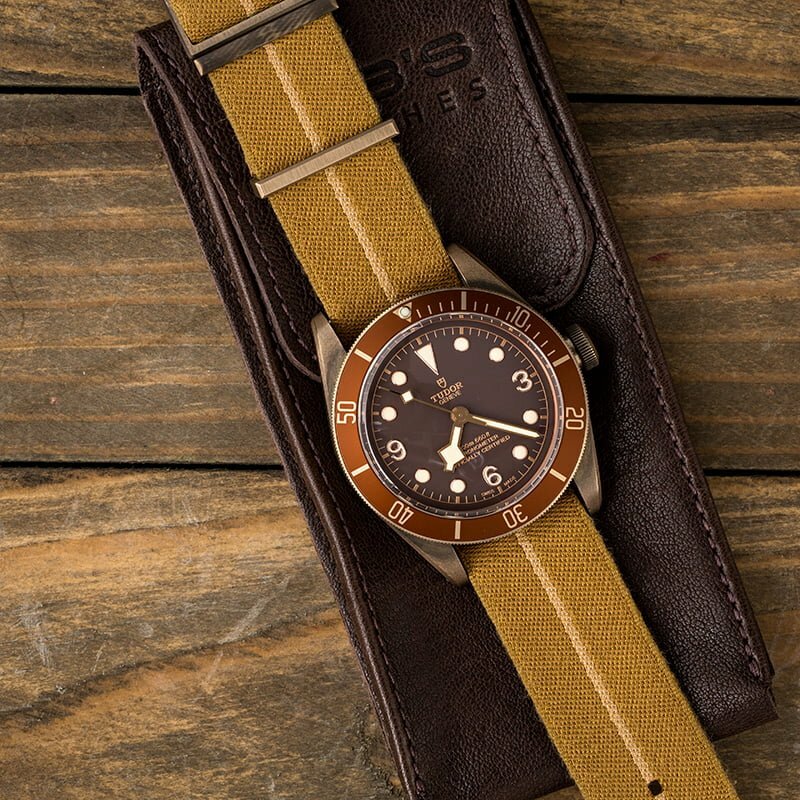 The generous 43mm case is a contemporary size, yet the choice of aluminum bronze alloy as a material is a nod to old-school ships and diving equipment. Plus, Tudor guarantees that the bronze will develop a unique patina over time—a trait often found (and cherished) in vintage watches. The case does not include crown guards and features an oversized winding crown similar to the vintage “Big Crown” Tudor Submariner from 1958. On the brown domed dial, we see the signature snowflake hands, in addition to luminescent round indexes and Arabic numerals at 3, 6, and 9 o’clock. Sheltering the dial is a domed scratch-resistant sapphire crystal. The bronze unidirectional rotatable bezel has a matte brown anodized aluminum insert, which has us thinking about vintage Rolex GMT-Master “Root Beer” watches. Further emphasizing the Black Bay Bronze’s retro vibe is its yellow striped jacquard strap, fashioned after vintage French military rescue parachutes. External vintage inspirations aside, beneath the case is where the Black Bay Bronze expresses itself as a modern Tudor dive watch. Although the Black Bay Bronze retains the same 200-meter water resistance, it is powered by the new COSC-certified in-house Caliber MT5601 automatic movement with a 70-hour power reserve. In fact, this was the first Black Bay model that was offered with a Tudor manufacture movement following the North Flag (MT5621) and Pelagos (MT5612) watches. While using vintage timepieces as design inspirations and equipping them with larger cases and modern movements is certainly not a new approach to watchmaking, getting it right is the tricky part. And it’s safe to say that not only is Tudor getting it right, but they’re also offering value driven prices that are hard to resist.